"Acquisition in Google analytics refers to the act of acquiring traffic from channels which may include traffic from sources like organic search, direct, referral, social or any other medium. " 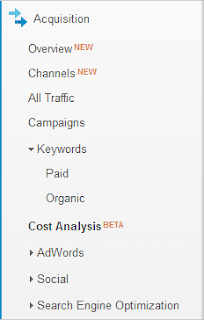 This new tab covers two new sections namely "Overview" and "Channels" along with the old sections like all traffic, campaigns, keywords, cost analysis (beta), adwords, social and search engine optimization. The overview section displays the acquisition, behavior and conversions data. Under the acquisition column, you can see the various channels from which your site is able to acquire traffic. Under the behavior column, you can see the metrics associated with the customer behavior like bounce rate, pages per visit and average visit duration. Lastly, under the conversions column you can see your converted goals. By default, the overview tab includes data coming from the channels section given below but you have options for including data from source/medium both or separately. The channel section displays all the metrics included in the overview tab along with the options for filtering the content with respect to source, medium, content, technology, traffic sources and visitors. Google has made the above changes in order to easily identify the sources that are sending the maximum traffic or are leading to maximum conversions. These two extremely valuable metrics are included under the new acquisition tab.